Find out how to the make the most of Pokémon X and Y's online features. Pokémon X and Y have been out for nearly two weeks, and, if you’re like me, you’ve already finished the main story and are now looking for something else to do with your beloved Pocket Monsters. Luckily, the game doesn’t have to end once you’ve bested the Elite Four and conquered the champion. 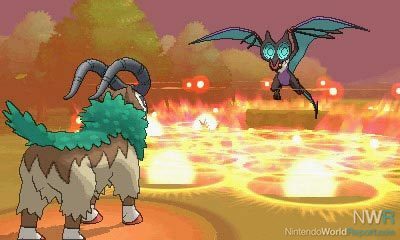 In addition to their post-game offerings, Pokémon X and Y offer several innovative online and local multiplayer options that give you the perfect excuse to put your meticulously chosen team to use. Game Freak experimented with a more localized online and local multiplayer system in Pokémon Black and White with the use of the C-Gear. While the C-Gear allowed for easy battling and trading using the cartridge’s infrared connection, players were still forced into Pokémon Centers if they wanted to take full advantage of Black and White’s wireless capabilities. 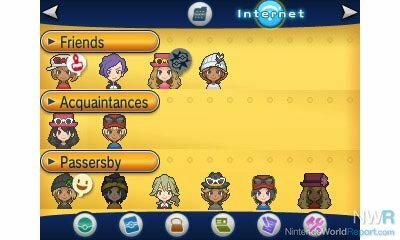 However, with X and Y they’ve completely removed this limitation with the introduction of the “Player Search System.” All of the game’s wireless features are now conveniently accessible via the touch screen. Utilizing the PSS, you can now see whenever your friends that own Pokémon X and Y are online, and you can even challenge them to a battle, offer up a trade, or simply initiate a voice chat by tapping on their icon on the touch screen and choosing the desired option. Additionally, you can also meet people in random matches and make them your acquaintances. Their avatars appear below your friends on the touch screen, and you can do everything except initiate voice chat with them. Likewise, you can also battle and trade with anyone in the vicinity of your wireless signal, regardless of whether or not you know them. These nearby players are listed under “Passerby” on the PSS. If there are no players nearby, the game will pull online players to fill the passerby spot. In addition to these options, the PSS also offers several other ways to battle and trade. The “Battle Spot” option randomly matches you with opponents from all over the world, and choosing it gives you the option for free or rating battles. Free battles allow all types of Pokémon and let you to choose from Single, Double, Triple, or Rotation. Rating battles are similar, though they require you to register with the Pokémon Global Link website. You can do this by choosing the “Game Sync” option in the PSS and following the on-screen instructions. Rating battles affect your online rating. Your wins, losses, number of battles, and rank will all be recorded on the Pokémon Global Link site, so I suggest you making sure your team is up to snuff in free battles first. Not to be outdone by the Battle Spot, the “GTS,” or “Global Trade Station,” is also available via the PSS. Like past games, the GTS allows you to put Pokémon up for trade so that people worldwide can offer you others in return. The beauty of the GTS is that once you put a Pokémon up, you’re responsibility for it is over. You can go on playing the game, or not, and your Pokémon will remain up for trade until someone accepts your offer. When depositing a Pokémon into GTS, the game asks you the type, gender, and level of the Pokémon you will accept from others in return. Afterwards, you just sit back and wait until someone accepts. Likewise, you can seek out other players Pokémon. Simply search for the type you desire or type in the name of the Pokémon you want if you haven’t encountered it yet and find the user whose offer best fits your needs. However, if patience isn’t one of your virtues there is a faster, but random method of trading called “Wonder Trade.” In Wonder Trade, players put up whatever they want to trade, and they’re then randomly matched with another player who did the same. Think of it as a Pokémon lottery. You’re likely to receive a Zubat or worse, but there’s always the chance that you’ll strike gold. It all depends on what Pokémon your random partner decided to throw out. Pokémon X and Y’s new wireless and online options are arguably the best in the series. Not only are they convenient and plentiful, but they also run smoothly. I hardly ever experienced any lag, even when playing with players from across the world. Likewise, finding random partners to battle and trade with is a cinch. Don’t expect to wait more than a minute at most. If for nothing else, Pokemon X and Y should certainly be praised for that. One useful feature that was missed in the overview is the set of O-Powers that you can provide for other players (or yourself). It's a good way to help out your friends and random players around the world. I like giving out experience bonuses and capture percentage boosts. Why can't they do this with Mario Kart?? For as much as I've ragged on Game Freak for a lot of things (even regarding X and Y), this sounds too easy. See someone who's online, start a voice chat with them from the game. I don't have to text them or email them or something just to get their attention. It doesn't sound like you have to jump through too many hoops just to talk with a friend. It's weird how Game Freak may not be with it in regards to certain things ("We had to turn off 3D to make the overworld beautiful"....but then the overworld looks pretty bad), but they seem to "get it" with online. I want someone to ask Game Freak directly why the hell they have removed online coop for the battle frontier like areas for the last few games. W,B,W2,B2, and now XY. Me and my online friends enjoyed going through the Battle Tower together and joking around and seeing how far we could go in the Gen 4 games. Battle Subway had everything but the online coop. You could do it with random people or local friends, but not people you have online and are actual friends. With all of the improvements and added functions why do they keep forgetting this? NWR GET THEM!!!!!! O-Powers are the biggest online component for me. Notably Hatching Power (the final power you receive), Bargain Power and Prize Money power. You can use them on yourself, or give them to friends. It costs more to give them to yourself, so it's worth it if you can receive them from someone else. It should also be noted you can cut down the orb regeneration time by accumulating 3DS steps every day. At 4x (the max), it's a new orb every fifteen seconds, or so I believe. I'm having plenty of online fun myself.